The old church on the outskirts of Wolwefontein village. You’ve heard the jokes about the travelling salesman and the farmer’s daughter, right? Some say they come from the Wolwefontein Hotel at the southern tip of the Karoo. Why is that, you might ask as you prowl the busy bar on a Friday afternoon, peering at the dusty python skin tacked to the wall, the leering eland looking down from next to the TV set, a cigarette firmly clamped between its lips, under the rows and rows of signed baseball caps. The Wolwefontein Hotel was built by farmer Harry Watson and his partner Hymie Glazer in 1920. Hymie dealt with the smouse, those travelling salesmen who criss-crossed the Karoo, touting everything from exotic pomades to London soap. It is said the smouse planned their trips to coincide with menu items offered by the various hotels along their routes. The smouse would often arrive in time for Poker Night on Thursdays, do their business with Hymie the next morning – and stay the weekend. Local farmers would also be there with their families. The combination of cards, travelling salesmen, liquor and lonely farmers’ daughters often led to Friday night fireworks at the Wolwefontein Hotel. Victor Watson, Harry’s great-grandson, will tell you about the time a farmer from Mount Stewart had an argument with a salesman during a poker game and chased him down the hotel corridor, firing shots into the air from his gun. You could see the bullet holes for years afterwards. As a result, Wolwefontein became known as Revolverfontein for some time after. 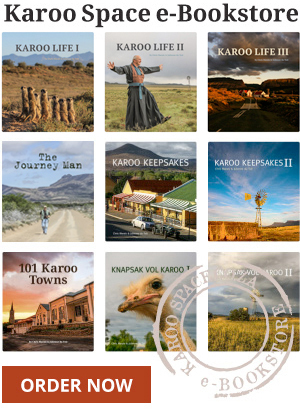 Find our newly-released e-Book, 101 Karoo Towns, HERE.